I have discovered I have a lot to give. And when I give, I notice others give more. Some of them I've formed relationships with, and trust opens giving, but I have also learned to trust strangers to share in abundance. Life is iterative, markets are not transactions and scarcity of attention is false. Our learnings compound abundance and there may be no limit to what we can produce. The basic idea is that incredible advances in technology have driven the cost of things like transistors, storage, bandwidth, to zero. And when the elements that make up a business are sufficiently abundant as to approach free, companies appropriately should view their businesses differently than when resources were scarce (the Economy of Scarcity). They should use those resources with abandon, without concern for waste. That is the overriding attitude of the Economy of Abundance -- don't do one thing, do it all; don't sell one piece of content, sell it all; don't store one piece of data, store it all. The Economy of Abundance is about doing everything and throwing away the stuff that doesn't work. In the Economy of Abundance you can have it all. It drives me nuts that scarcity is seen as such a fundamental requirement for creating a business. Sure, there are plenty of businesses built around scarce resources, and sure, Dave's time and my time are scarce, but that's no proof that businesses can't cruise along profitably creating voluntary loyalty by knowing their customers better, never betraying them, always being available and fixing problems, responding more quickly than others.... you get the picture. But go to business school and what they teach you is how to create artificial scarcity. That's the kind of thinking that got us into the present mess. Digging deeper, Howard Reingold is fostering a discipline of cooperation studies. You can also find this wiki page, with a link to a 1994 essay by Flemming Funch who I used to blog alongside a lot in the early days. I suppose that abundance economics would include giving one's ideas and actions freely, because one feels like it, because one sees the need for it, and because one understands that when you contribute to the whole, we all benefit. The Internet is a good example of some of the principles of giving freely and of abundance. So many resources here are given freely, without expecting anything directly in return. So many people are willing to help each other, even though they don't really have to and they don't get "paid" for it. I think there are many times more power in actions that are done freely, because one sees a need for improvement, than in actions that are done reluctantly, because one is forced by lack. I believe that abundance thinking, and actions, trumps the minds and greed of the scarce. That the one overarching pattern in the present wave of innovation is share control to create value. That what powers it isn't Moore's Law processessing infinite supply or Metcalfe's networking choice and collective wisdom. It is the capacity of people to produce when old frameworks don't in the way of each other. So much of this is about how we envision the future. Not in the grand sense that the rules are changing. But when two or more people can believe in an opportunity, they can share cost and risk to get there together, in the process reduce them -- and learn so they and others can build upon it. Every time I see Gabe Rivera of TechMeme, I ask for the same thing -- MeMeme. Give me TechMeme where the core index is based on who I read, about 150 people at any given time, to show me what my friends are interested in. I used to ask this from people who make Newsreaders. Because simply somedays you are too busy to read everything, but you want to make sure you haven't missed something big. That's the real value I derive from TechMeme today. But what I really want find something that is big with my friends, which in the larger blogosphere is actually something small. Today we have two new and seriously great kinds of attention tools. Newsreaders give us the ability to personally personalize. Combined with persistent query feeds, you can follow the people and things you know you want to read. Similarly, social networking services with a purpose let you aggregate the objects of your friends, be it pictures with Flickr, or posts with Vox. Tagging then lets you pivot for social discovery, but that is digging deeper than you often have time or interest for. TechMeme and others show us mass popularization. Different communities help things bubble up. In Social Software, you first saw this with Blogdex and DayPop. What in the blogosophere has the most attention within a given time period. Now we have Digg, del.icio.us/popular, Reedit, Netscape, Technorati, YouTube, Dabble, Last.fm, Flickr Interestingness and a gazillion other increasingly rich examples. This is a Wisdom of Crowds we couldn't gain before for discoverable knowledge. As an aside, I wonder how original Slashdotters feel about Diggers' favor for a popular answer rather than a leading question. * Tools that let me personally personalize should give me just one more degree of interestingness and popularization. Since Flickr has both kinds of attention tools, let me give specific suggestions for extension. For within My Contacts's Photos, show me the most viewed, favorited and commented by my contacts. Then show me the most viewed, favorited and commented pictures by my contacts in Everyone's Photos. Now, this is just one user's greedy suggestion, and there serious usability and algorithmic challenges to overcome. But what I'm getting at is part of the future of media. The other night I watched the evening local news broadcast for the first time in a while. Its funny how local news attempts to localize national news. The idea is that if they show you a Mom in the Bay Area of a Soldier in Iraq, you can relate to that and it brings the story home. But unless the story originates from that Mom or Soldier, it is just an overlay with too much of a contextual shift. Similarly, when an item of local news is made national -- it is too shallow for our local tastes and we are attracted to it simply because or fair city is made popular. I empathize with the expert editors behind these mass media and their attempts to connect the interesting for me, when me is lost in a demographic. But I've had a taste of going direct. When I carry the burden of discovery, and float around YouTube's popular and related clips, I can compose a broadcast for myself. The outstanding political commentary, funny stuff and best soccer highlights from around the world. But after a long day of work, I'm tired, and want the network to work for me. Cue up not what is popular, or what the people I subscribed to produced. Cue up what my social network has found interesting. At any given time it may be local, national, international, topical or mundane. Of course, in the process of actively consuming it, I'll leave behind breadcrumbs of attention to make it better for my friends. UPDATE: I've been ranting about this for years. Sam Ruby hacked together a nifty MeMeme and the result shows a clear and simple foci of attention (a post by Spoksky at last glance), FeedDemon has something in the works and Tailrank has something close. Let's admit that we are pathetically apathetic when it comes to politics. Most of us don't vote, very few of us are civic participants, even some of us don't pay taxes. Let's embrace the fact that we don't have time for politics, even when its electing representatives. And by embracing our less than ideal civic state, we may change it. But time with the right tools is on our side. I just skimmed (because I've been participating in the blog conversations) a fresh copy of Chris Anderson's The Long Tail. By now you may know this new economic for how the network changes business models for discovery and fulfillment. Chris has also written about social production, distributed across The Long Tail. 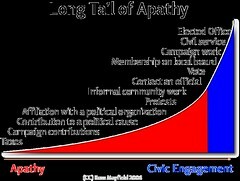 Building upon the Power Law of Participation, I'd like to suggest a model for civic engagement that embraces apathy. The horizontal axis is time committed, the vertical axis ranges from apathy to civic engagement. Voice and Equality: Civic Voluntarism in American Politics surveyed 9 categories of civic participation: voting, campaign work, campaign contributions, contacting an official, protests, informal community work, membership on a local board, affiliation with a political organization, and contribution to a political cause. This lead Thomas Ehrlich to opine: But unless voting is accompanied by the other political activities, it reduces citizenship to a superficial and relatively passive activity. Not that Ehrlich is wrong, but my point is this -- few of us have time or interest in politics, but there is a way for us all to have civic engagement within our means. That way is though social software. As seen in the Power Law of Participation, effective communities can engage participants at their own level while functioning as an organization. This of course, is a theory based upon what we see in open source and Wikipedia as an organization, or the Wealth of Networks. I was tempted to add in Asylum or Resignation as a high engagement activity, as it is the closest to the right to fork you find in these emergent models where checks and balances are more liquid. • Elected office -- representing the time and interest of a constituency. • Taxes -- you pay them, right? • Death -- inevitable, yes, but also a proxy for doing nothing. Didn't put it in the image. When I napkined this model for Kevin Fong of the Mayfield Fund (no relation except trademark dispute ;-) over lunch at Brainstorm, he suggested that without apathy you have revolution. I suggested that the 95% turnout for the first Ukrainian election, which was rather revolutionary, might support his theory. I would like to think that political participation overlaid upon Maslow's hierarchy of needs may be a well-curve with one end sparking rebellion, and the other being, well, an ideal. Robert Putnam in Bowling Alone surveyed the decline of social capital in twelve categories One counter argument he acknowledges is the rise of mass-membership organizations like the Sierra Club or AARP. It should be noted that Affiliation with a Political Organization does not necessarily mean fostering social capital, as members can be only connected through proxy. However, you could view a successful political organization as mass, with it's own Long Tail of Apathy. Time columnist Joe Klein, author of Politics Lost, suggested at Brainstorm that his vote for the next President would be decided by how much she asked of the citizenry. That's right -- don't ask for my vote, tell me how I should contribute. The WW II generation shared a common sacrifice and understanding for what it meant to be American -- which made them good citizens and leaders. Doing what you can for your country used to be a shared value. But as the political season approaches, let's consider what has changed (as little in the political landscape has). The cost for personal publishing has fallen to zero. Its common for citizens to express a facet of their identity online. The cost for group forming has fallen to zero. Networked appeal has proven itself as a fundraising mechanism. A broad conversational network and common sense repository supports collective sense making. Today social software has gained use broad enough to support civic engagement. During the last Presidential campaign we held hope that politics was changing. First we thought we could get someone elected from the grassroots, but restoring topsoil takes greater effort. Then we even hoped that political institutions could change how they engaged the public, but the elected culture isolated itself without precedent. Quite frankly, this barely happened. But this time around, groups are forming to take action. 92 percent of AmeriCorps sponsoring organizations say members helped them increase the number of persons the groups served to a large or moderate extent. 72 percent of AmeriCorps members continue to volunteer in their communities after their term of service ends. 87 percent of former AmeriCorps members accepted public service employment (including governmental and nonprofit work) with three years after completing their AmeriCorps service. It is encouraging to think that NetGens have a latent demand for civic engagement, The children of the baby boom may not buy off on political messages, but they want to play a role, to give forth. Let's admit there is hope together, each in our own way. Wiki maniacs were in full attendance at Wikimania last week. Not just the participants in the Wikipedia community, but users and developers of open source wiki. Seventy of 400 attendees were members of the press, which served to amplify the impact of the event, but also highlight the changing of the guard. Jimmy Wales was busy doing more than putting a face on a community with back to back interviews throughout the conference. One interview with a German daily, Sueddeutsche Zeitung, was poorly translated into a Reuters story that ran with the false lead that Wikipedia was going to tighten editorial controls and consequently Slashdotted. Really, Jimmy was talking about Wikipedia 1.0, an effort to develop a print version. Refutations here and here. When we were laughing about the episode, Jimmy said, "why would we *ever* do that, it's not like a document is ever finished!" If only the story broke on Wikinews. "I've seen things like this happen once or twice before," observed Mitch Kapor, software pioneer and head of the Open Source Foundation. "We're at the Big Bang of the next information revolution." One of the simplest arguments I've used to get people out of a traditional mindset is to point out a statistic -- the cost of transactions in the U.S. More than 50% of the non-government GDP in the U.S. is based on transaction costs. Supposedly, price should be an efficient signal for communicating what to produce. However, when you have price, so to follows a panoply of middlemen from accountants to lawyers. When you take price out of the equation, particularly in small groups and with network distribution, you reduce market friction. Wikipedia is demonstrating a model of content production based upon open licensing with collaboration at scale. Whereas open source software development pioneered this model, they are scaling it even further, if for no other reason than content does not have the interdependency that constrains the development of code. When you look at Jimmy's list, note that each are ripe for models of scaled open production. Our freedom to share is clearly under attack by prior property regimes and new ones such as DRM. As producers, we have discovered our own power to share under new regimes such as Creative Commons licensing or production and distribution models such as open source and open content. As consumers, most of us have yet to recognize the limitations we face or the new ones being constructed around us. As either a consumer or producer, the shift from markets to commons is one of freedom -- and economic benefit. If you wonder if there is a business in all this, let me make a simple argument. The disruption of open models of production is the greatest arbitrage opportunity in modern industry. We do not yet know what value will remain from the 50% of GDP that is transaction costs. Steven Weber noted that unlike transaction cost analysis to inform buy vs. build decisions -- we do not have a framework for when to open property, but many companies are taking the risk. Craigslist, for example, generated $10 million in revenue while cannibalizing $50-65 million from Bay Area newspapers. This is not just because the net decreased distribution and search costs to unlock latent demand in long tail-esque fashion. Strangers are trusting one another to build a common resource and community -- with a network enabled structure that has decreased coordination costs and greater social incentives. The chasm of the long tail is peer production, and we are just beginning to understand it. We are driving transaction costs out of the equation so we can reinvest and create higher order value. Hopefully that help clarify the shift from markets to commons, but what about the shift from firms to the commons? Again, transaction costs come into play, but beyond Coase's argument that decreased transaction costs lead to vertical disintegration of the firm. Thomas Malone has argued the trend of decentralization as an inevitability because decreasing transaction and coordination costs make it possible while providing greater social incentives for employees and better decision making at scale. John Seely Brown and John Hagel also point to the increasingly distributed nature of business, but they make a more profound argument for the value of social networks within the enterprise to provide a sustainable edge through innovation. Enterprises have sought to drive down costs through business process automation and outsourcing as a competitive advantage. But only putting people back in the process to handle exceptions with the freedom to innovate provides a sustainable advancement. The only thing is, to unleash the creative capability of employees requires sharing control. Which brings me back to sharing will be free, as in beer. Under the construct of a firm, employees are contracted to produce and the firm gains property. They largely have the freedom to share ideas and they have the right to break the contract at-will in many jurisdictions. But while under contract, they do not have the right to share, that is owned by the employer for the purpose of exclusive sharing with the firm itself. But what happens when an employee wishes to contribute to the commons? Contribute to an open source project? Or blog? Or contribute to Wikipedia? In many companies the employee does not have the right to engage in external productive communities without pre-approval. So they do so anonymously, or on their own time, without support from their firm. My suggestion, is that as companies open they will learn that they are loosing value by not letting employees own the right to share. The right to share is different from the freedom to share, because when you own the right you can contribute property to the commons at your best discretion. When a developer has a great idea at two in the morning for an open source project, having to seek permission from an employer before engaging hinders the creative process. When you look at commercial open source companies, you may see new frameworks arise that grant this right to employees. The frontier of decentralized organization is granting employees the right to decide how to share, not just the freedom to share in condoned mechanisms, in areas they are not paid to do so. I think we just beginning to understand how to enable self-organization so we can innovate at scale. I'm sharing this thought in hopes we might learn where we are going.